The financial industry pays in average twice the salaries than «normal» industries and employs in average twice as many highly educated people from all disciplines. Instead of inventing new sources of energy or more energy efficient machines and cars; instead of developing new and affordable drugs to cure cancer, HIV, multiple sclerosis, Alzheimer’s or Parkinson’s diseases; instead of eliminating famine, illiteracy or oppression of people; instead of fixing our societies problems and designing new ways to organise economy, education, immigration, retirement, politics, social welfare, tax or legal systems; instead of solving all these and many more urgent problems, our smartest guys spend their brainpower to invent highly sophisticated financial instruments to trick the highly complex regulatory systems to maximise obscene short term profits for their financial industry with highly damaging consequences in the mid and long term. 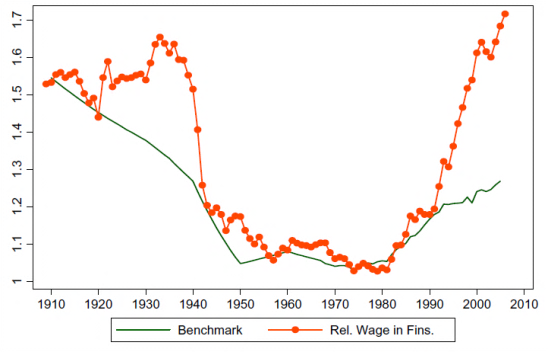 It is instructive to look at the development of salaries and educational levels in the financial industry compared to other industries during the last hundred years. The time before the Great Depression starting with the stock market crash, which was caused mainly by overleveraged lending to normal people to buy inflated stocks (sounds familiar? 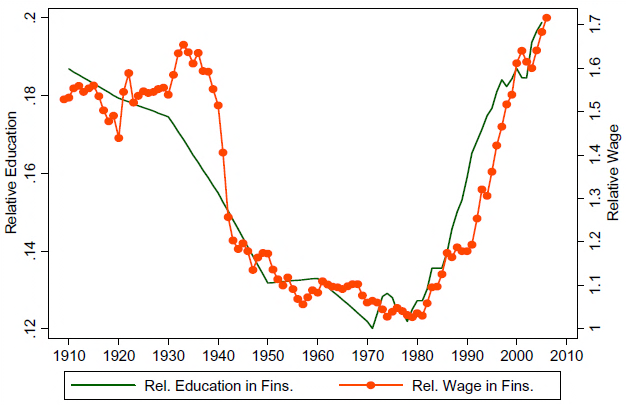 ), salaries and the relative educational level in the financial industry soared to unsustainable highs. Only the Glass-Steagall Act of 1933 started to change this by separating commercial banks accepting deposits and investment banks issuing securities. Salaries and relative educational levels in the financial industry finally came down to average levels outside of the financial industry. When you talk to graduates of the 1950s to 1980s, the brightest people went to work in «producing» and world changing industries and only the boring nit-pickers went to work in banks. This was a time, when real economic value was created, lots of innovations we still are profiting from were invented, and the wealth of ordinary people rose in accordance with the growth of the economic output. In 1980 the Depository Institutions Deregulation was the first of several legislations during the following years that deregulated the financial industry once again. And what happened? Average salaries and educational levels rose again to almost twice the level of other industries. The smartest people were attracted once again to work in the financial industry – by economically highly successful companies, by the smartest colleagues, by the highest salaries, by unmatched development opportunities and by a highly competitive environment that allures overperformers. They invented new and highly sophisticated financial products, outsmarted ordinary people to buy these products and earn much more money than normal people even could dream of. 1) Do we believe that this function is best exercised by the smartest people in the world or would it not be done at least as good by ordinary or even boring people? 2) In terms of comparative advantages: What would we like our brightest people to work on? And what accomplishments would we like to pay astronomical salaries for? As a society with immense challenges ahead we should guide our brightest and smartest people to work on problems that really matter. We should install programs comparable to the Manhattan project initiated by Einstein, Szilárd and Wigner or the Apollo program initiated by Kennedy to focus the best resources we have to work out solutions for what is most important for humankind. We should not misdirect future generations of talents to work in the wrong industry on the wrong problems only to cause more problems. Once you live in this world, you really believe what you are doing is adding value and you will do everything to preserve this system. Intelligence should be rewarded royally, but only if it is used for the good of society. And intelligent people should be aware that intelligence is not an achievement but a gift. that’s where the smart people went: “quants” designed CDOs and developed systems for high-frequency trading. Dutch national public broadcasting corporation VPRO filmed an excellent (and scary) documentary about it a year ago. i strongly can recommend both of them to watch.